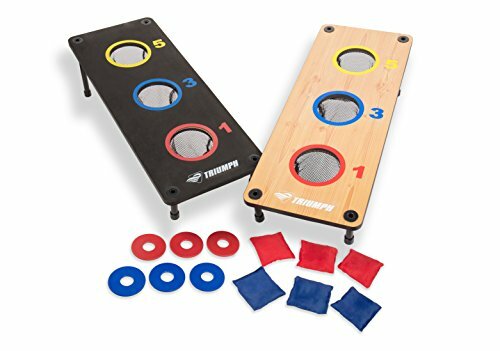 Enjoy two games in one with the Triumph Sports 2-in-1 3 Hole Bags and Washer Toss Combo. Two classic yard games combine in this set, offering hours of bean bag and washer tossing fun. Just flip the board and reattach the legs for your choice of washer toss or bean bag toss. The colorful board makes it easy to see different point zones and target areas, while nets capture bags and washers with ease. This outdoor game is the perfect addition to a family gathering, barbecue, or hangout session.